Editor’s note: Michael Shank is director of foreign policy at the Friends Committee on National Legislation. Madeline Rose is legislative associate for foreign policy at FCNL. The views expressed are their own. Despite dire warnings of anarchy, mass violence, and potential genocide, the White House has said nothing about the U.S. position on the situation in the Central African Republic (CAR). And while we appreciate the leadership of Representatives Ed Royce (CA-39), Chris Smith (NJ-4), and Karen Bass (CA-37) in raising awareness of the crisis within Congress. and welcome the November 20 statement by Secretary of State John Kerry, this level of engagement is insufficient. The administration and Congress must engage quickly with the international community before more civilians are killed, and the country – and region – spiral further out of control. This is serious, and Washington should take it seriously, lest we end up with another preventable mass atrocity on our hands, and only grief and political regret to show for it. The directive also created new governmental structures to enable the U.S. government to act with greater expediency and coordination in response to early warnings and “red flags” of potential mass atrocity or genocidal situations. And the red flags could not be clearer in CAR. Local religious leaders have issued pleas for international action. Humanitarian organizations, anti-genocide advocates, and key U.N. member states have expressed shared concerns about the threat of mass atrocities against civilians. Even two strictly apolitical entities, the International Committee for the Red Cross and Médecins Sans Frontières, have cautioned that violence is impeding their ability to deliver lifesaving humanitarian assistance. Second, there are significant security implications at stake. CAR shares borders with six countries, several of which have received significant U.S. assistance and are also plagued by violent conflict. The country’s lawlessness and inability to control its borders has already attracted regional militia groups, including the Chadian rebel leader Baba Ladé, the Lord’s Resistance Army, heavily armed Sudanese poachers, and potentially actors from Nigeria and the Democratic Republic of the Congo. While the full scope of foreign activity in the conflict is impossible to track, conflict trends suggest that foreign engagement is increasing. De-escalating and transforming the conflict now is critical to ensuring that CAR does not become a new ground for radicalization, arms trafficking and violent recruitment in already volatile region of the continent. Finally, violence in the country has taken on more organized and interreligious tones. Over the course of the rebellion, violence has increased steeply between Muslim and Christian communities throughout the country. Ex-Seleka forces, local militia, the LRA, and other armed groups are intimidating and manipulating civilians into violence. As violence and rumors of violence spread throughout the country, it increases tensions, fears, and rumors and tears civilians across interreligious and interethnic lines that did not necessarily previously exits. Seleka has reportedly increased its troop size from 5,000 fighters at the end of 2012 to now more than 20,000, and has broadly expanded its attacks on civilians and villages. Christian militias, known as anti-Balaka, have also emerged in many parts of the country and clashed with ex-Seleka elements. These attacks by anti-Balaka groups then, in turn, triggered violent reprisals by ex-Seleka forces. These dynamics create a perfect tinderbox for a transition to large-scale violence. The United States must engage fully with the international community to help immediately restore stability to the country, protect civilians against potential mass atrocities, mitigate dangerous conflict trends, and protect space for lifesaving humanitarian assistance. Failure to act now, multilaterally, will make it harder and more costly in both lives and dollars for the U.S. to act later. The business of waiting until a preventable conflict becomes an intractable crisis – as we did in Mali and Syria – cannot be our status quo. If we are in the business of prevention, the key is to engage early and often, not late and lackadaisically. The people of CAR need us today, not tomorrow. Next entry »What would JFK have done about Iran? We must not jump into the Central African Republic as recommended by the right-wing politicians here. Instead, we need to just let the UN sort it out. That's the thing. They aren't GONNA! Then the world doesn't give a damn. As usual. Let the UN handle things? Like they did in Rwanda? That worked out well. These aren't "problems". This is genocide. I am sure you had the same response about Iraq. The idea that "If it's pushed by a liberal it must be bad" is both ignorant and misguided. This is not a liberal vs conservative issue! "US must act now over Central African Republic"
Why must the US be the one to act now over Central African Republic ? Have I suddenly awoken in a world where all other nations have ceased to exist ? Our country has always been at the beck and call of those in need, and we have always responded accordingly. But we need to draw the line somewhere. We cannot continue to support these other countries. It is time for these other countries to step up with their own militaries to step and take responsibility for their own people. We should not be expected to finance the problems of the world. It's tiring, being the only nation ever expected to cure the ills of the world. I know banasy. I really don't remember when this all first started, but jeez it's bleeding us dry. Do these other countries have no dollars, or more essential, their young ones to sacrifice. I mean, I'm all for helping out when we can, but our country, literally, is falling apart. We need to look back inside our own borders to see what we need, like we don't already know, and take of us first. The problem is bobcat2u, is that these gutless wonders who head these countries are taking full advantage of the stupidity of our right-wing politicians in Washington who are only too liberal in giving away our tax money and sending our troops everywhere from the South Pacific to Timbuktu!. All they do is carry out orders from Washington D.C. I agree totally, bobcat. I don't think the US should become completely isolationist, but putting every other country's welfare before our own does a grave disservice to the citizens. What is the African Union doing? Anything? You're suggesting we figure out our own problems in the face of tragedy like this? Are you for real? Thank you, bobcat2u. You nailed it! Your post truly saddens me. People do not deserve to suffer because they were unfortunate enough to be born into a country with corrupt, inefficient governments. The reality is that as with most politically and religiously driven conflicts, it begins with minority groups, who decide that violence is the way for them to get what they want, yet THOUSANDS of people who want no part in the conflict suffer. Four year olds are getting their throats slit, mothers are being killed for trying to protect their children, people who have nothing to do with this conflict are being murdered in clod blood for no good reason. CAR barely has a functioning government right now, do the millions that live there deserve to suffer because of the country's weak government? You're right, maybe the US has no interests in CAR, but I sincerely hope no one who is ever in need is unfortunate to have to rely on you for help if this "not our problem" mentality is what you live by. Lacy, the point is that there are many other countries out there that can also help; what is being asked of them? Where is the African Union? Hyperbole aside, how much is expected of the US, when there are the same problems plaguing our country? Kids are being killed. Crime is rampant. Because it's not being done by the government, it's any less a problem? Why MUST the US be the ONLY one the world looks to to solve their problems when we can't solve our own? Gee, maybe we should ask the good citizens of Detroit how much they wish to contribute. By the way, here is a sample of how our government process works. Since 2005 General Atomics has donated $1.6 million to members of the Unmanned Systems Caucus, and has subsequently received $248 million dollars worth of drone orders from the Department of Homeland Security alone. The story notes the CAR borders six countries, several of which have received US military assistance. Why don't they get involved? This is just like the stories about Syria which say how deeply concerned Turkey, Saudi Arabia and Israel are, but it is the US which needs to take action. No, The Towel Head countries must act now to control their fellow Towel Heads. jeez!!! The authors are lobbyists!!! The CAR is described as a failed state in permanent crisis, facing mutinies and rebellions, since its independence from France in 1960 and is one of the least-developed countries in the world. The self-declared emperor, Jean-Bedel Bokassa had headed a brutal regime. Decades of instability have undermined the economy. Diamonds are an important source of income – and rivalry. Let regional powers take care of CAR. The US might see a lack of strategic interests there. Teacher: " George Washington not only chopped down his father's Cherry tree, but also admitted doing it. Now do you know why his father didn't punish him?" It very suffering news and African nations must take their lead and not wait for any international intervention . The world of today is all about interest and should has been to blame only the United States why not the rest of nations who share the blame for not paying attentions . I am asking help from the Africans brothers to define the next move and protect their own regions. Fact is African leaders are docile and totally bereft of ideas about diplomacy and conflict resolution. Due to pervasive corruption and underdevelopment people take up arms against the government. Let the so called african union take care of that mess!! Unfortuently we are in too deep around the world. Because of our administrations policies over the last 50 or so years. I think we will get to central Africa and attempt to clean up these situations at some point in time. However, the African communities with the financial assistance from around the world should create a unit of force such as the EAU, Nato, and others to ensure these atrocities cease to exists. Period. Due to corruption of many African governments, this task is alarming and goes unnoticed by the so-called free world. Sad but true!!!! No. No matter how well intended, we need to learn how to stay out of the affairs of other nations. 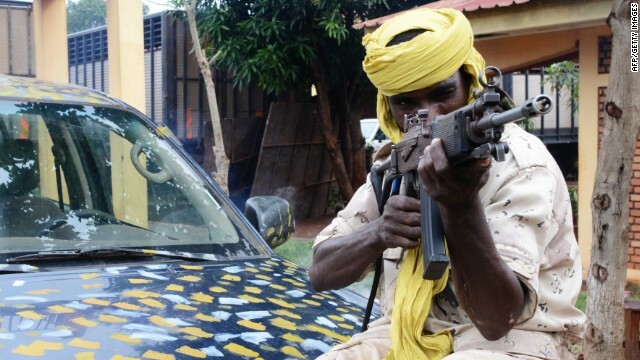 Maybe the U.S. could help by handing over Detroit to the Central African Republic.
" U.S. must act now" Every time I see those words the IGNORE button immediately gets pushed. Lets stay out of this crap all over the world. No wars in Africa, the Middle East, Asia, or anywhere. Concentrate on defending the US and stop wars of conquest! No, the USA does not have to do one thing for CAR, or for any other place in Africa. Let's focus on ourselves. We have more problems here than we have been able to handle, so far. Let the Africans bury the Africans. I disagree with the assertion that mass instability and atrocities in the CAR put U.S. Security at risk. This is the same expansive and exaggerated argument used to drag this country into the Vietnam War. We should be honest with ourselves and the world. Humanitarian concerns are important but less so than a direct attack in the U.S. Or against a primary economic or political partner or region. Call for assistance or attention to the matter and acknowledge that the U.S. May partner with regional powers but not lead. At some point we should encourage them to rule their own destiny instead of trying to save everyone on our dime. The US needs to mind its own business and stop meddling in countries where it has no vital interests. The CAR is of no consequence to the US. If the people there want to kill each other until there's no one left, let them do so. Don't risk one single American life on a place that has no importance whatsoever to the US. The US suffered no damage to its interests from what happened in Rwanda, and it will suffer none if the same thing happens in the CAR.